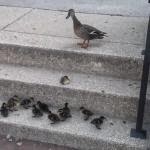 This mama duck is patiently watching her ducklings climb the stairs. When I watch the video I get a strong urge to assist these little ones in their struggle. I love this example of a parenting lesson from nature. Take note how mama duck shows her own brand of empathy. She waits patiently, occasionally showing the way and then coming back, until all of her children are safely up the stairs. Take note of what she does not do. She does not help them. She must know they can all make the jump with a bit of effort. I suspect that she would not have taken that path if the stairs were too much of an obstacle. Because she knows they can do it, she does not offer help. This mama duck knows where they have been and where they are going. As in the psalm, she hems them in behind and before. She knows that part of caring for them is to let them struggle. They need to know that they can overcome obstacles or they will not survive. Part of caring for our human ducklings is to stand and watch them struggle. We would much rather swoop in to rescue, but, if we do this we create two new problems. Rescued children do not learn as much as challenged children and the lessons they do learn are not as strong. There is nothing like having to wrestle a bit with a problem to really fire up the neurons. A struggle teaches you about how to conquer the current problem and it teaches you how to conquer future problems. Rescued children get dangerous messages. They learn they are not capable enough to solve problems on their own. They learn that struggle means you are less competent. They learn to fear challenge. We want children to know that with God they can solve problems. We want them to know that everyone struggles and if you do not struggle, it means you do not learn. We want children to embrace challenge. We want children to know that their God knows them, knows their life struggles, and hems them in behind and before. They need to know that God has His hand on them, even when they struggle. Be a mama duck. God has this under control!